Additional Info: Something A little different (again): Recently I was asked about the prognostics significance of TP53 mutations in chronic lymphocytic leukemia (CLL). To share my response: This figure is from a recent study of TP53 mutations in 308 cases of CLL (the largest so far). The main points: 1. In CLL with a deletion of 17p there is a 64% chance that TP53 is mutated - 18 out of 28 (I originally thought this number was higher, but as it turns out 30-40% of the time del 17p is associated with unmutated TP53). 2. In CLL with an intact 17 there is a 6% chance that TP53 is mutated - 16 out of 269. 3. Any TP53 abnormality (mutation, deletion, both together, or either alone) confers a poor prognosis regarding progression free survival and overall survival - panels A and B of the figure presented from this manuscript. SO, in patients with an intact 17p, TP53 deletion analysis is appropriate. 4. TP53 mutations predict chemo refractoriness INDEPENDENT of 17p deletion status. This is the piece of information that is new to this paper. A patient with a deletion of 17p AND a TP53 mutation will more rapidly develop chemo refractoriness that a patient with a deletion of 17p WITHOUT a TP53 mutation. A picture is worth a thousand words - See figure 4C from the figure. My enthusiasm is a bit tempered by the fact that the numbers of patients with TP53 mutations is actually quite small even though the study is quite large and very well done. However, it is very interesting data and suggests that testing for TP53 mutations may have prognostic value even in patients with 17p deletions - I would suggest that confirmation of these findings would be necessary before adopting into routine practice. One final discussion point is the utility of prognostic testing in CLL patient in general. I leave that to the comments. 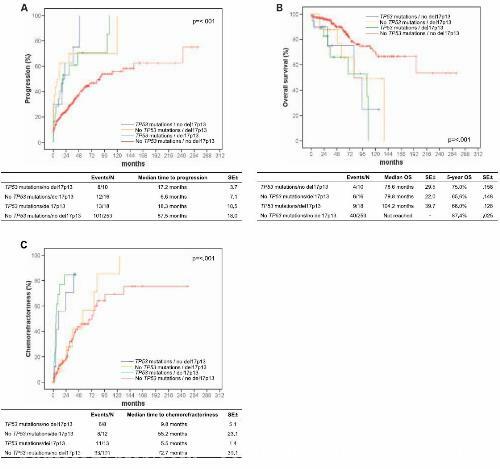 Reference: Rossi D, Cerri M, Deambrogi C, Sozzi E, Cresta S, Rasi S, De Paoli L, Spina V, Gattei V, Capello D, Forconi F, Lauria F, Gaidano G. The prognostic value of TP53 mutations in chronic lymphocytic leukemia is independent of Del17p13: implications for overall survival and chemorefractoriness.1: Clin Cancer Res. 2009 Feb 1;15(3):995-1004. I hope the free advertising for Clinical Cancer Research and promotion of the wonderful science published there by these authors makes up for the fact that this image is most likely copywrited. A prememtive thank you very much for alowing this low quality reproduction for educational purposes... and very sorry... To everyone else: go look at the orginal linked to in the other comment I posted.